More than a year and a half ago, when Donald Sterling was the most vilified man in American media and Donald Trump was relatively low on that list, I suggested that a good cure for Sterling’s poisonous racism and bigotry would be for the now former owner of the NBA’s Los Angeles Clippers to discover and embrace Islam. This is a religion without racism. If true Islam could change Malcolm X from a man who believed White people were devils into a man who was happy to worship Allah [swt] alongside his White brothers and sisters in Mecca, it could do wonders for Sterling, whose gross history of racist comments and business practices eventually got him kicked out of the league. Today, as the United States turns its attention to next year’s presidential election, the most talked-about candidate is a man who apparently believes he has discovered all there is to know about Islam and is no closer to embracing the religion than Sterling is to inviting Magic Johnson over to his house for a Kwanzaa celebration. Trump’s presidential campaign has played out as if he’s in competition with himself to see which group of people he can most egregiously offend and alienate. Any other candidate with such a track record would have been shamed out of the race by now, but the not-so-secret formula to Trump’s success at getting attention is that the real estate mogul is rich enough to fund his own campaign and therefore isn’t beholden to pleasing any sponsors. Headlining the flood of sane and reasonable responses to Trump’s insane and unreasonable idea, current U.S. president Barack Obama mentioned that Muslims make up a diverse and rich segment of the American population, including “sports heroes.” Trump replied on Twitter that he didn’t know of any Muslim sports heroes, which has now drawn sports media outlets like ESPN and Yahoo! into the discussion regarding Muslim athletes in America. 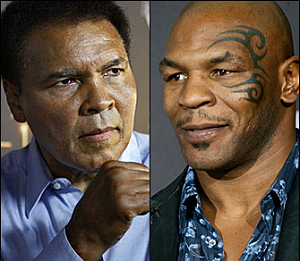 What makes Trump’s claim that there are no Muslim sports heroes in America even more ridiculous is the reality that two of the most famous athletes in this planet’s history — two athletes whom Trump has met personally — happen to be a pair of Muslim boxers: Muhammad Ali and Mike Tyson. The two former world heavyweight champions have naturally been sought out by media members looking for a response to Trump, and just as their styles were very different in the ring, Ali and Tyson had blatantly different views on the subject. Ali, 73, said in a statement to NBC News: “I am a Muslim and there is nothing Islamic about killing innocent people in Paris, San Bernardino, or anywhere else in the world. True Muslims know that the ruthless violence of so called Islamic Jihadists goes against the very tenets of our religion. As he has done for the better part of his six-plus decades in the spotlight, Ali’s comments resonated with the public, both Muslims and non-Muslims. As much as the charismatic champion was a master of hitting and not getting hit in the ring, he has been an expert at saying the right thing at the right time in the right tone. Tyson, meanwhile, is notorious for his missteps and regrettable decisions, and this looks like just the latest one. Some in the Muslim community might view Tyson’s apparent support of Trump as something akin to a Black man endorsing the Ku Klux Klan, or a Jewish man joining Hitler’s Nazi movement. Some may not think it’s that serious. Either way, it doesn’t look or sound good. I was a fan of Tyson the boxer long before I converted to Islam in 2013 — and long before he converted to Islam while in prison between 1992 and 1995 — so I have some practice in looking beyond his cringe-worthy words and actions to find a silver lining. At times I could be described as a Tyson apologist. While I’m not going to defend Tyson’s support of Trump, I will say this much: Tyson and Trump have been friendly with each other since Tyson’s heyday in the 1980s and ’90s as a huge moneymaker for Trump’s hotels, which hosted some of Tyson’s fights. Trump reportedly tried to help Tyson get out of prison. Tyson at least knows Trump better than most of Trump’s critics, and perhaps he — like NFL superstar and apparent Trump supporter Tom Brady — simply doesn’t want to throw his friend under the bus publicly. Maybe Tyson is even afraid of what a man with Trump’s wealth can do to him, a man who has had more than his share of financial problems, if he turns him into an enemy. Tyson has shown himself in the past to be loyal (to a fault) to charismatic older men who profit off of him; namely boxing promoter Don King. And so standing up for the honor of the ummah, his billion-strong global Muslim community, may be less important for Tyson than sticking up for someone who he believes has had his back. I wouldn’t do it, but I’m not the one in the position of having a friend say something that offends me and my people. The one positive that I can find in Tyson’s take on Trump is that he is — even if it was not fully his intention — displaying an admirable commitment to the democratic process. America is a country that theoretically allows the people to pick their leaders. What Tyson is really saying, beyond any personal biases, is that if the majority of the voters want Trump in office, then he shouldn’t be disqualified from the race because he has offended people. As Tyson said, if the people don’t like Trump, they won’t vote for him. That has actually been the scariest part of Trump’s presidential campaign. We can say that he appeals to the lowest common denominator of Americans — the racist, xenophobic, Islamophobic, hypocritical, blindly privileged lot of them — but as Trump gains supporters it becomes more apparent that there are a lot of Americans in that lowest common denominator. There are at least enough to make Trump the most popular candidate among Republicans and conservatives. As long as his numbers are on the rise, he is not going to turn down his blatantly un-American stance. If anything, he’ll continue to turn it up. Surely he has realized that the people who want to “make America great again” are actually as un-American as it gets. As 2015 turns into 2016 and the race to replace Obama boils down to a 1-on-1 main event, obviously most Muslims in America will hope Trump becomes a non-factor. Because as much as the two-time election of Obama represented what we thought was progress for America, the public picking Trump would be a tremendous step backwards, into a place where it’s likely that no Muslim American — including our sports heroes — will feel safe on their own soil. Mohammad Ali was a bigoted racist, typical of many Muslims and exemplifying the racist nature of Islam. This is not right. Islam considers as an ugly things. Muslims not welcomed in America, they have their own country and all need to go back and fix their country. STOP TRYING TO CHANGE OUR AMERICAN CONSTITUTION. LIVE BY OUR RULES AND OUR CHRISTIAN BELIFES OR GET THE HELL OUT.